2. With PayPal, you're protected from checkout to delivery. Paypal spots problems before they happen with the latest anti-fraud technology. Your financial info is never given away. And if something goes wrong with your order, your eligible transactions will be fully reimbursed. 3. In the event of unauthorized use of your credit card, you must notify your credit card provider in accordance with its reporting rules and procedures. 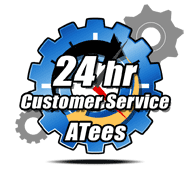 Shop Safely and Securely: ATees.com takes great pride in offering a safe and secure online shopping experience. We understand that the safety of your personal information is extremely important to you. We use a wide array of electronic and physical security measures and devices to protect your personal data and credit card information from unauthorized access.